Henrjeta Mece, "Dialogues" (detail). 2011. 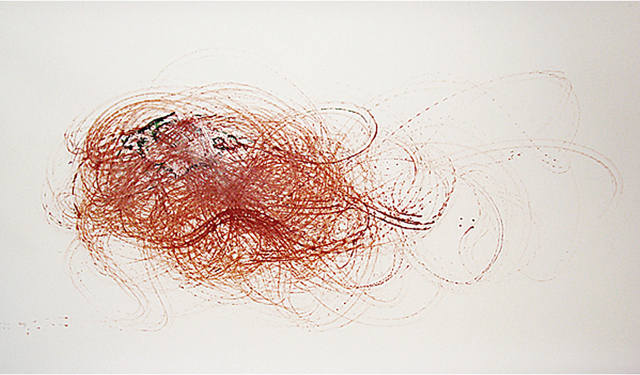 Dialogues on Uncertainty is a series of drawings that examines poetics of survival. Stability as a state of our ‘supposed’ well-being and success no longer exists in the contemporary world: space and time, place and non-place, clash through speed, only to be replaced by notions of adaptability and fluidity. Henrjeta Mece, “Dialogues” (detail). 2011. Oil on mylar. It is precisely the tension between respect and impiety that distinguish Henrjeta Mece’s work by the post-conceptual impulse to point to the very medium without completely stepping outside of it, creating a seductive work that retains its self-reflexivity and criticality. Mece takes apart the medium of drawing quite carefully, acknowledging the fragile and the personal, and augments her medium-specific critique with playfulness and beauty. 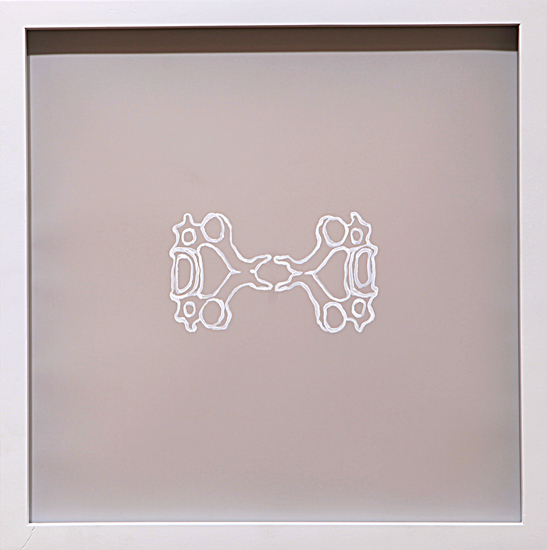 Mece’s work with mylar suggests layering and transparency. The notion of being able to see, quite literally, the wall or the frame behind the work, enables the viewer to immediately step outside the notion of looking at self-contained microcosms of the artist’s creation. The translucency of the material further adds an element of unfinishedness or in-betweenness through the association with tracing. Tracing is a method of uncertainty and apprenticeship that Mece seems to acknowledge and reconcile with her form. The first layer of the works is a painted Atlas, the first cervical vertebra of the spine. The Atlas connects the head with the body and is relatively unique in that it is designed to allow more movement than the other vertebrae. It is the Atlas that allows a wide rotation of our head. The use of the Atlas as an almost “background” is poetically charged; a foundation on which a freer or merely less cerebral, more intuitive, visceral form of creation takes place. 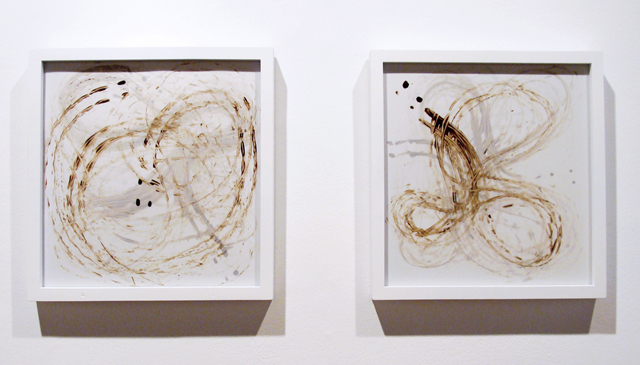 The drawings use oil paint as a material and have two defining constituents. The paint is applied to the surface of the mylar using toy cars, as a method. The second is the temporality. The artist executes these drawings when she is having phone conversations. The temporality is thus split into two: the duration and the state of the duration. Phone conversations, by nature of being dialogues, are unpredictable. It’s possible to talk for hours (in which case, one has to wonder, does she not run out of paint?). On the other hand, the doorbell rings and the conversation is abruptly disrupted. Aside from duration, the associative nature of dialogues forms different levels of involvement within each conversation. Henrjeta Mece, “Dialogues,” 2011. Oil on mylar 148″ x 36″. 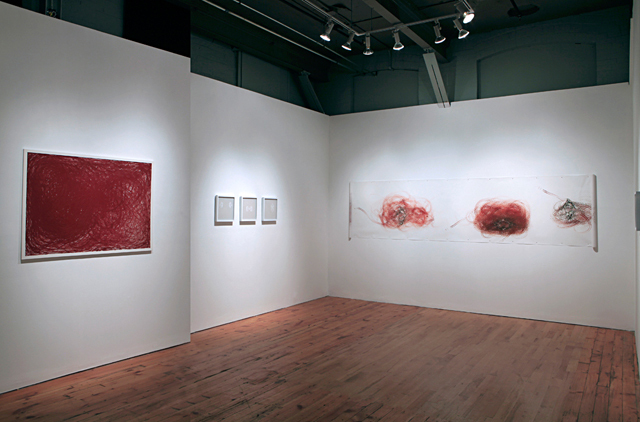 Mece reflects on her medium by setting up situations in which she is mentally removed from the final works. Although the removal is only partial, she exposes the most vulnerable state of mind for an artist—disengagement. She destroys the myth of the artist’s extreme precision. She “makes” works while she is occupied with something else and it doesn’t help that, that something else, is a quite quotidian activity. The implication is not that the work is secondary for her. To the contrary, she identifies that urge to perfect and over-think. She also reveals that mechanic non-specificity can be beautiful. The constant struggle between form and content, thinking and intuition, is the material that Mece employs for this body of work. Mece’s replacement of her hand with the toy cars indicates a desire to remove the artist’s hand from the work. This important gesture can be read as the artist’s desire to point to the work itself rather than her identity as a producer. Another interpretation is testing the relationship between form and content, exploring the extent to which the artist can be physically removed, while the mark somehow still belongs to her. The tension between the mark-making and the artist not being the absolute mark maker can be read as the exploration of the artist’s relationship with the work. How far can an artist go? When does the work stop belonging to the artist? This thread also relates to methods of automaticism that Mece explores on a rudimentary yet evocative manner. Through the use of the toy cars, Mece twists the postmodern concept of the death of the author [i]; it is not enough for the artist to not be read into the work—she exposes her detached involvement with the work in an act of self-scrutiny. This is mimicked by the circular motions of the car in many of the works; the archaic symbol of self-reflexivity, the circle, is disrupted by the lack of containment and the violent tire marks on the fragile mylar. The texture created by the material heaviness of oil paint provides a point of stark contrast to the light, almost ephemeral nature of mylar. The historical connotations of the material mimic the physical characteristics of the paint—it is somewhat surprising that the mylar holds the oil paint yet the coupling also seems complementary. Henrjeta Mece, “Pauses,” 2011. Bitume on mylar. 12″ x 12″. The surface of the works also, point to temporality. One can only imagine—the longer the conversation, the deeper the colors get and the more violent the tire marks become. The temporality triggers an anxiety most typically found in moving images. As the viewers trace the marks, apprehension builds. It is impossible to separate the final forms from the motions that caused the marks and the constant conflict between the desire to look and the need to engage, trap the viewer into the three-dimensional surfaces of the works. “The medium of painting, sculpture or film has much more to do with the objective, material factors specific to a particular form […] That is, the notion of a medium contains the concept of an object-state, separate from the artist’s own being, through which his intentions must pass,” [ii] Rosalind Krauss states. Krauss’s definition of “aesthetic of narcissism” in relation to video-works take on a newer, more contemporary meaning when considered in the context of Mece’s works— this series in particular. The artist’s attempt to represent, to give, to expose, while methodologically withholding herself; mechanizing and temporally limiting each work point to a different kind of narcissism. Mece’s “narcissism” is one of self-important exploration of her limits as an artist and the medium that she seems to want to transcend. The viewer cannot help but voluntarily be imprisoned in the works that reveal yet bury so much of what would be the traditional modes of the artist and production. Henrjeta Mece, “Atlas + Atlas.”Oil on mylar. 12″ x 12”. [i] Barthes, Roland. Image, Music, Text. Trans. Stephen Heath. New York: Noonday Press, 1988. [ii] Krauss, Rosalind. “Video: The Aesthetics of Narcissism” October Vol. 1, Spring, 1976: 50-64. Henrjeta Mece is a multidisciplinary artist, curator and writer based in Toronto, Canada. She completed her BFA at OCAD University (Toronto) and later her, MFA. She is the recipient of numerous awards including, Canada Millennium Excellence Award and has participated in several national and international residencies including, The Banff Centre for the Arts. Mece’s artwork and curatorial projects have been exhibited throughout Europe and North America and her collaboration with Rae Johnson is currently featured at the Museum of Canadian Contemporary Art as part ofthe “This Is Paradise”exhibit. Recent activities include a yearlong research as a Vtape Fellow, and curations for A Space and Toronto Free Gallery. At present, Mece is co-curating an exhibition for Zweigstelle Berlin Gallery in Berlin, Germany, and has been awarded an artist residency in Iceland in 2012. Posted in content, on artists and tagged Dialogues on Uncertainty, Henrjeta Mece, Merve Ünsal. Bookmark the permalink.